Bob and Edith have been married for 65 years. They live in a small bungalow that they moved to 3 years ago in the town that they have lived in since they got married. Bob and Edith have been retired for a long while. They enjoy spending time in the garden and go to the local pub quiz. Bob and Edith see their son and his partner most weeks. Gary does the heavy shopping for them. Cathy visits every month or so. Their middle child, Louise, died of breast cancer at the age of 46. The grandchildren also visit every few months, along with the two great grandchildren. Bob was diagnosed with Alzheimer’s disease 6 years ago and this has gradually affected his memory and ability to do daily tasks. For the last year he has relied on Edith to remind him and prompt him for everything. He doesn’t sleep well and has started to forget who Edith is. Bob has been attending the memory clinic and also a group called singing for the brain. Bob has arthritis and uses a stick when he remembers to. He is in quite a lot of pain which he doesn’t understand. He also has a hearing aid. Edith was diagnosed with vascular dementia a few months ago when Gary became concerned about her mixing up household tasks, for example putting shopping in the oven. Edith has glaucoma which is treated with eye drops daily. She also takes medication for angina and diabetes. Recently she has forgotten to do this some days. Gary has rung social services and asked for an assessment for his parents. He is worried about their ability to look after each other, and is upset that Bob has recently been asking when Louise (their deceased daughter) is going to visit and this has been upsetting Edith. You go out to do an assessment of Bob and Edith. Bob has a needs assessment. You go out to do an assessment of Bob and Edith. Edith has both a needs assessment and a carer’s assessment, which are combined into one assessment for her. This assessment was done at the same time as an assessment with Bob’s wife, Edith. A lot of the information came from Edith. Bob was able to tell me and show me some of the things that are important to him. I spent some time with Bob and he showed me the garden. He likes to spend time there when it is fine and to sit at the window watching the birds on rainy days. Bob and Edith told me that he has always done the heavy work in the garden and that he enjoys keeping things in order. Bob said that he likes to listen to the radio. He mostly listens to radio 3. Bob also likes to watch the grand prix and cricket. Bob showed me photographs of his children, grandchildren and great-grandchildren. Edith explained that their son Gary and his partner Mark live nearby and they visit most weeks. And that they see their daughter Cathy every month, and the grandchildren and great-grandchildren every few months. Edith also explained that their younger daughter Louise died sixteen years ago. Bob evidently thinks Louise is still alive because he asked Edith when Louise was going to visit. Edith said that Bob sometimes doesn’t recognise her or other members of the family. What’s happening for you at the moment? Bob said that he looks after himself and helps Edith around the house and in the garden. Edith explained that Bob has had Alzheimer’s for six years and for the last year Edith has needed to remind him about what he needs to do and when, and prompt him when he forgets again. I noticed that the electric mower was out in the garden in the rain. Edith said that she is worried that she can’t see if things aren’t clean and put away. Edith has just been diagnosed with vascular dementia and also has glaucoma, diabetes and angina. Her son Gary told her recently that she had put the shopping in the oven instead of the fridge, and he noticed her using a pan that hadn’t been washed. Edith explained that Bob needs a lot of attention. He gets up in the middle of the night and Edith has to try to get him back to bed when he thinks it’s breakfast time. Edith has to watch him all the time. Bob also tends to follow Edith around the house. Bob said that his leg hurts. Edith told me that Bob has quite a lot of pain from arthritis and Edith doesn’t know what to do about this. Edith and Bob used to go out including to the pub quiz. Edith said that recently Bob has shouted and sworn at the quiz master and so they haven’t been since. Bob does go to memory group and singing for the brain every week. Bob said he likes to sing. What is the impact on you? Bob said that he is worried about not being able to get the ladder out to prune the trees. Also that Edith was getting older and needed some help. Edith explained that the things she is worried about are: Bob getting up in the night; who would get help if she had a mini stroke; how long she will be able to support Bob and keep things going in the house. What would you like to happen in the future? Bob was not able to tell me what he would like to happen in the future. He wants to keep doing his jobs in the garden, seeing his family and spending time with Edith. How might we achieve this? Bob said that Gary and his friend (Mark) could help with the ladder. (Gary agreed that would be fine). Bob said that Edith could do with some help in the house and with the cooking. What strengths and support networks do you have to help you? Edith and Bob have been married for 65 years. Edith supports Bob every day. Their son Gary and his partner, and daughter Cathy also provide support. Bob and Edith made the decision to move to their bungalow three years ago and this continues to help them to manage. Bob has good support from memory clinic and singing for the brain, which in turn helps Edith. Bob needs support to manage day to day tasks. This is currently provided by Edith, who in turn needs support to continue as a carer and because she has needs of her own. With some support from the local authority and other services, as well as from their family, Bob and Edith will be able to manage well at home. This is set out in the care and support plan for Bob, which should be read alongside the plan for Edith. We will review the care and support plans in six months. Edith’s family will help her to contact us if things change before then. Bob is eligible for care and support. At the moment, the support is provided by his family, especially his wife Edith. See care and support plan for Bob. We have also done an assessment for Edith, and she has a care and support plan. We have offered a carer’s assessment to Gary and he will consider this. Edith told me that the most important thing in her life is Bob, her husband, being settled and looked after. Bob has had Alzheimer’s for six years and for the last year Edith says she has been his memory, reminding him about what he needs to do and when, and prompting him when he forgets again. Edith wants to stay in her home with Bob for the rest of their lives. She has always looked after the home and wants to keep doing this, and to manage things herself as much as possible. Edith feels lucky that she has her son Gary and his partner Mark nearby and they visit most weeks. And that she sees her daughter every month, and her grandchildren and great-grandchildren every few months. She doesn’t want to worry Gary or rely on him too much but she does like to see him and Mark whenever they can. Edith has recently been diagnosed with vascular dementia. She had a series of mini strokes over the last year, including one where she had a fall and bruised her knee. Edith said she has started to forget important things like putting her eyedrops in and taking her medication for glaucoma, diabetes and angina. She’s found it more difficult to do the housework and washing. Gary brings the heavy shopping. Bob tries to help but he makes it more difficult as he isn’t able to finish things he has started. Edith is worried that she can’t see if things aren’t clean and that the house is not in a good state. Gary told her recently that she had put the shopping in the oven instead of the fridge, and he noticed her using a pan that hadn’t been washed. Edith is still able to keep on top of the post but finds it difficult to read some of the letters. Bob needs a lot of attention. He gets up in the middle of the night and Edith has to try to get him back to bed when he thinks it’s breakfast time. Edith has to watch him all the time. Bob also tends to follow Edith around the house; sometimes she feels he is checking up on her. He has quite a lot of pain and Edith doesn’t know what to do about this. Bob has started not to recognise Edith and also has forgotten that their daughter Louise died. He keeps asking when she will visit. Edith and Bob used to go out including to the pub quiz, but recently Bob has shouted and sworn at the quiz master and so they haven’t been since. Edith told me that she is worried that she is not able to do things and that she sometimes feels useless. She has been keeping things going since her husband Bob became ill and is now finding it more difficult to do this. Edith is very tired from having to keep an eye on Bob all the time. She is sometimes too tired to cook or ends up sleeping in the chair. Edith is finding it very difficult that Bob is starting to forget his family and also events from their past together. She doesn’t know what to say to him about Louise. Edith is worried that if she has a mini-stroke then she might fall over and not be able to get help and Bob wouldn’t know what to do. Edith wants to stay at home with Bob. She wants to keep seeing her family but not feel that they are there to check how things are. Bob goes to a memory group and singing for the brain. Edith would like him to be able to keep going and to do more things like this. Edith wants to make sure she has her eyedrops and medication when she is supposed to so that she can keep going. Edith wants to know that the house and the garden are in order, and to still enjoy her home. She wants to carry on spending time in the garden and feeding the birds. Edith enjoys watching quiz shows and wants to be able to keep doing this. Edith said that she needs some help with the house and garden. She would like someone who takes pride in their work. She wants to carry on doing the cooking. Edith will need an alarm in case she leaves the gas on or the tap on. Gary has said he can come round every week with the shopping and put this away. He is also going to help Edith with the post. Edith would like to carry on going to the pub quiz. Mark said he would go with her while Gary stayed with Bob. Gary will also take Bob out for a drive once a week. Edith would like some way of remembering about her eyedrops and tablets. Edith wonders is there is a way of getting help if she has a fall. Edith would like to have some uninterrupted sleep but she doesn’t know how this could happen. She would like some advice about what to do when Bob forgets the family, asks about Louise or swears. Edith has been a carer for Bob for quite a few years. She has managed this well. Edith is resourceful and has put in strategies to manage her dementia, for example using the calendar and having reminders around the house. They have been married for 65 years and have a close family. Edith’s son Gary and his partner, and her daughter Cathy provide support. Edith gets a lot of pleasure from seeing her grandchildren and great grandchildren. Edith and Bob made the decision to move to their bungalow three years ago and this continues to help them to manage. Edith has a good social network from her quiz night and they provide emotional support to her. 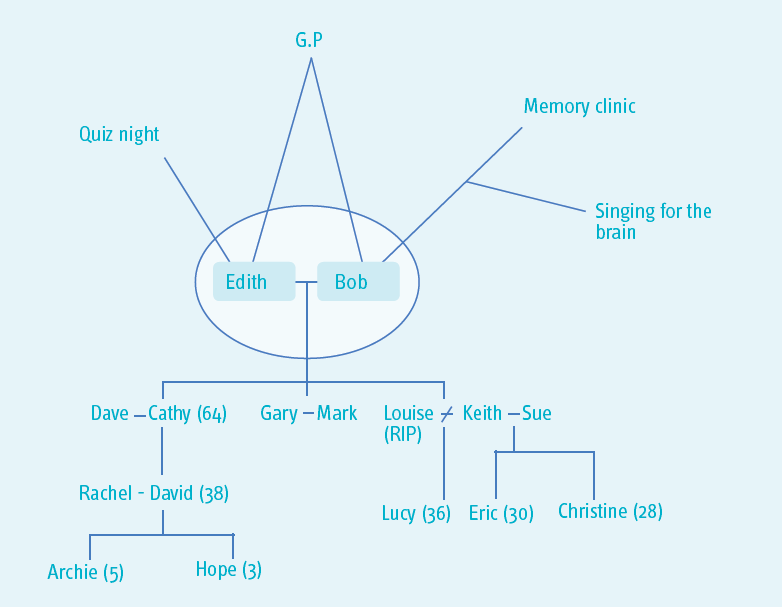 Bob has good support from memory clinic and singing for the brain, which helps Edith. Edith is both a carer and has needs for care and support of her own. Edith has a number of health problems, including a recent diagnosis of vascular dementia, which impact on her ability to manage day-to-day tasks. Edith wants to continue to manage her home and look after her husband, and needs some additional support to do this. Edith has a good support network from her family and has a social network. Most of the support that she needs is for her husband. Edith also needs some support for herself. In the future Edith may want additional support from the carers’ centre. She may also need more direct help with day to day tasks. We will review the care and support plan in six months. Edith’s family will help her to contact us if things change before then. Edith is eligible for care and support, and for support as a carer. At the moment the only service she is having from the council is assistive technology, as her family are providing the other support. See care and support plan for Edith. We have also done an assessment for Bob, and he has a care and support plan.